The Songs of Distant Earth is a very thoughtful science fiction novel. It’s not chock full of chases and weird experiments or other derring-do, but it keeps the reader involved and more importantly it makes the reader think. It is a good example of what is known as “hard science fiction”. 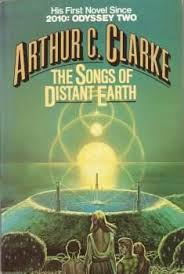 Written by Arthur C. Clarke, a man who is no stranger to science, the book deals more with real possibilities than with theories that have no apparent foundation in reality. The main portion of the book occurs somewhere during the 39th century, around 200 years after the Earth’s sun has gone nova. With the benefit of a thousand years’ warning, mankind has developed and sent seed ships to the stars with the most hospitable planets orbiting them. The ships contain the seeds to rebuild mankind, from humans to domestic animals to bacteria necessary for human survival, to be shepherded into life by robots. The ships cannot travel very fast so the great distances take hundreds to thousands of years. But humans keep making the ships better and by the time the solar system is incinerated, they have developed a quantum drive, which allows them to travel at close to 20% of the speed of light. One of these advanced starships, among the last to leave Earth, the Magellan, is travelling toward a system with a planet that has been named Sagan Two. The planet is presently inhospitable to life, but is covered in massive amounts of ice. The Magellan aims to terraform the planet by melting the ice and using their quantum starship to maneuver the planet into a more biofriendly orbit. Along the way, they travel very close to the planet Thalassa, which had been the destination of an earlier seed ship, which reported in upon colonization, but then had lost contact with Earth. The Magellan decides to investigate and to look into using the water on the planet to re-ice their deflector, which has become worn out from constant collision with space dust. Thalassa is a beautiful planet, mostly covered in oceans, but with three large islands that support a functioning human society. But it is a society that has become complacent and happy in their idyllic existence. The Magellan upsets this becalmed life when it appears and sets up its ice factory. The crew from the Magellan mingle with the population and become involved with the people who live there. Of course, the inevitable happens and several crew members want to stay on Thalassa. Others want to end the mission and stay permanently on Thalassa, using the volcanism of the planet to create new land masses for the colonists sleeping on the ship. Ultimately, the novel deals with the question of whether humanity can thrive without the existence of challenge. Our history has been the story of struggle against the elements, survival against the wild beasts and survival against each other. Our literature is full of strife and most people would say that any good story depends on it. What happens when that gets bred out of the species? If you remove challenge and aggression, will we stagnate? It is a well-written story that I highly recommend.